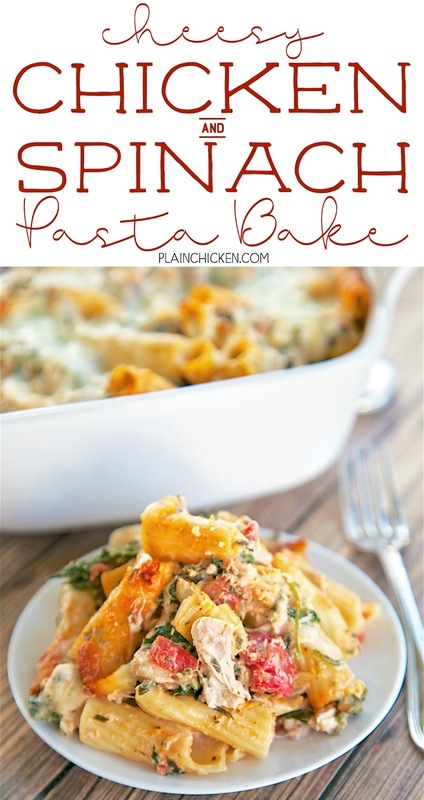 Cheesy Chicken and Spinach Pasta Bake - pasta, onion, spinach, chicken, tomatoes, chive-and-onion cream cheese, garlic and mozzarella. This casserole was a HUGE hit!! Everyone cleaned their plate! Can make ahead of time and refrigerate until ready to bake. Great potluck meal! 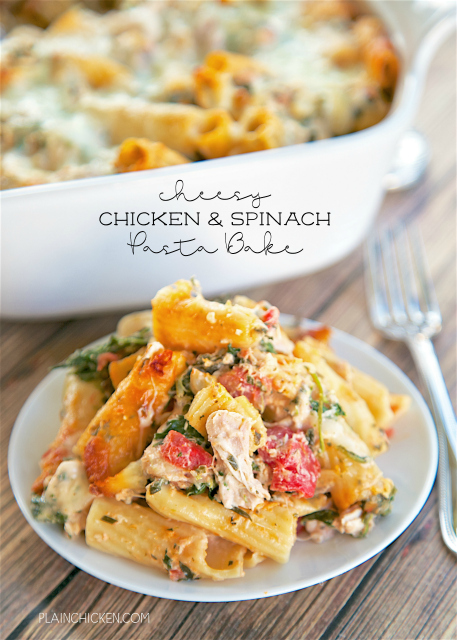 This Cheesy Chicken and Spinach Pasta Bake is a new favorite. We ate this for dinner the other night, and I am ready to make it again! This pasta bake is so easy to make and tastes incredible. It is easy enough for a weeknight, but it would also be a great dish for company. You can even make this ahead of time and refrigerate it overnight. I love make ahead dishes! The secret ingredient in this Cheesy Chicken and Spinach Pasta Bake is a container of chive and onion cream cheese. 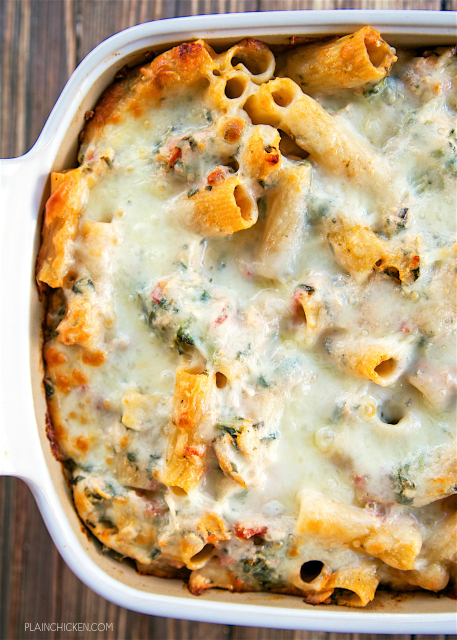 It adds lots of flavor and makes this pasta bake super creamy. This smelled amazing while it was baking. We couldn't wait to dig in! All you need is a little side salad and a garlic roll and dinner is ready!!! Preheat oven to 375 degrees. Highly spray a 9x9-inch pan with cooking spray. Set aside. Cook rigatoni according to package directions. Drain and set aside. 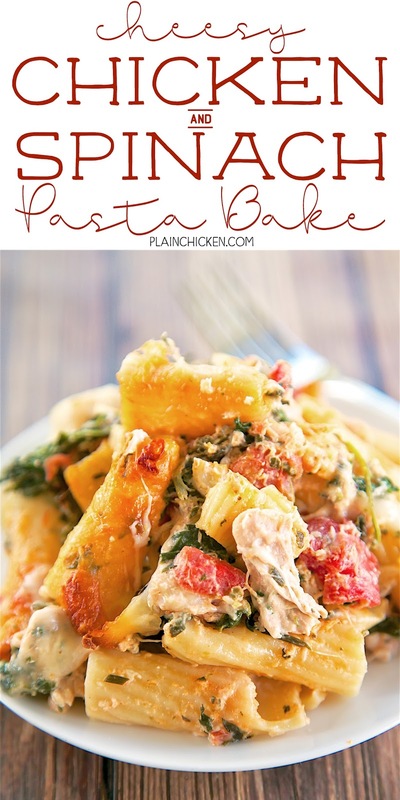 In a bowl, combine cooked rigatoni, drained spinach, cooked chicken, onion flakes, tomatoes, cream cheese, garlic powder, salt, pepper, and 1/2 cup mozzarella cheese. Spoon mixture into prepared baking dish, and sprinkle evenly with remaining shredded mozzarella cheese. Bake uncovered for 35 to 45 minutes. I LOVE, LOVE this recipe! It's much like the Chicken Spinach bake. I also add fresh mushrooms if I have them. It's so yummies! My picky almost 2 year old loves it as well! I think I will make it tonight. I am always looking for recipes with spinach. Can't wait to make this and taste the cream cheese in it. I am making this right now. It looks and smells scrumptious! When do the onion flakes get added? To lighten this up could you use greek yogurt instead of cream cheese?